5 different themed parks in 1 amazing destination. Sunway Lagoon is Asia's Best Attraction. This multi-award winning attraction is recognized by the International Association of Amusement Parks and Attractions (IAAPA) as Asia's Best Attraction for four consecutive years (2007 – 2010). Whether you are looking to cool down in the tropical sun @ Asia's Best Water Park, looking for a hair-raising experience @ Scream Park, enjoying the thrilling rides @ Amusement Park, getting your adrenaline pumping @ Extreme Park, or getting up close and personal with your favourite animals @ Wildlife Park, there is something for all @ Sunway Lagoon. 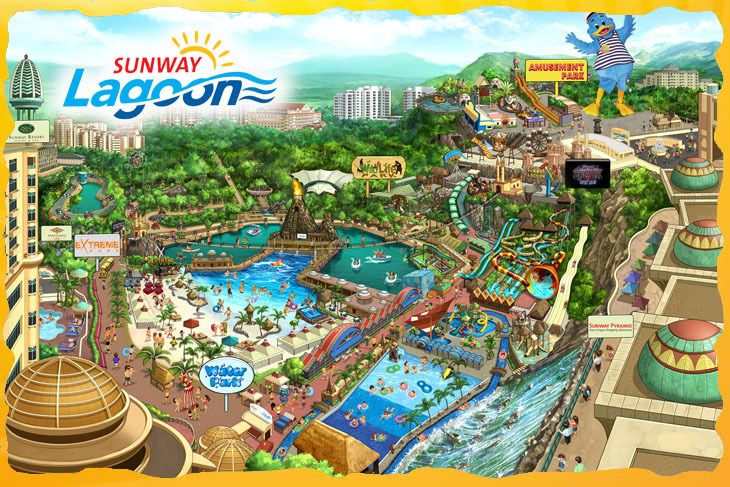 Sunway Lagoon is also home to the regions hottest events and concerts. Glitz and glamour, or cool and happening, Sunway Lagoon has hosted the most sought after events in the region like the MTV World Stage (2009, 2010 & 2012), Arthurs Day Celebration and the Quiksilver Revolution Tour. With more than 80 rides and attractions, and within 15 minutes from Kuala Lumpur, Sunway Lagoon is the ultimate destination youll have to visit when youre in town!